ESFPs are one of the most lively and charismatic personality types in the Myers-Briggs® system. Given the titles “Entertainer” and “Performer”, they are often stereotyped as talkative party animals who want to be the center of attention all the time. But is that really what sums up the ESFP? While many other types are given detailed, nuanced type descriptions, the descriptions for ESFPs are almost always lacking in substance and depth. This is extremely unfortunate, because ESFPs have just as many varied characteristics and admirable qualities as any other type. So I want to bring up some of their key characteristics in this article! 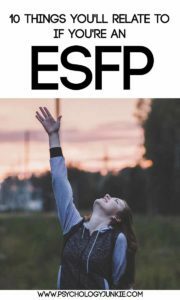 If you’re an ESFP and you have any thoughts to add be sure to let me know in the comments! As an ESFP I try to use what’s around me to its fullest potential. When I’m in a crisis or there’s nothing to do, I’m good at finding solutions, opportunities, and creative avenues to fix the problem or bring enjoyment to the atmosphere. I’m a wanderer at heart and love to discover new sights, sounds, places, people, and experiences. I love collecting experiences and coming in touch with cultures and landscapes I’ve never experienced before. I love to travel, try new foods, and test the limits of what I’m capable of. As a dominant Extraverted Sensor, I’m very aware of what’s practical and real. While hypothetical scenarios can be fun to entertain for a while, at the end of the day I want to work with what I’ve got in front of me and I pride myself on keeping a level head. I’m very in touch with reality and nature. I’m so attuned to what’s happening around me and every detail that I notice instantly when someone’s body language changes, when their mood alters, or when there’s an opportunity available. Sometimes I feel like everyone else is walking around in a daydream and if they could just see what’s right in front of them they’d be so much happier and more at peace with the world around them. I’m very compassionate and want to make people happy and comfortable. That said, I’m not going to pretend for anyone (unless I’m literally acting in a play). Being sincere and authentic is vital to me, and I appreciate the same quality in others. The more real and honest you are with me, the more I’ll feel at home with you. I need to feel that what I’m doing with my life will have a positive impact on the world, or else promote my own personal growth and self-expression. I don’t want to work for a nameless, faceless organization. I want to make a difference, even if it’s in a small way, with the people and communities I care about. I can crack jokes or swap sarcastic jabs with the best of them, but I’m also sensitive and careful not to hurt other people’s feelings. Sometimes I use humor as a way to deflect attention away from myself, especially if conversation is making me feel uncomfortable or I feel like someone is prying too much. I enjoy making people laugh, but I’ve also learned to use humor to defend myself from people who seem unsafe, unethical, or overly meddling. Words of affirmation are great and everything, but at the end of the day, I’m a practical person and I know people need more than platitudes and generalized advice. When someone I care about is struggling I want to do something to lighten their load, whether it be babysitting their kids, taking them out for a fun night to get their mind off things, or making them a mix tape of their favorite songs. I love telling fascinating stories and I love hearing them. I’m often told I’m a great storyteller and I instinctively know how to make a story interesting because I intersperse relatable humor or action to keep people guessing what will happen next. I can easily tell if someone is getting bored or losing interest and I know how to switch things up to keep them engaged. I absorb information better when I’m actively participating with the world around me. Stick me at a desk, close the windows, and force me to listen to a lecture and I’ll feel numb and listless. But let me wander outside, spend time in nature, get my hands on things, experiment, and learn while being actively engaged in the world around me and I’ll remember things better. I can handle a lot of stimulation and know how to retrieve the most useful facts and details that are relevant to my life even in the midst of chaos or busy, active environments. Do you relate to these statements or have any you’d add? Share your thoughts in the comments! Susan I really enjoyed reading how you describe us. As an ESFP I sometimes also like to be more around children than adults during family and friends gatherings. I feel sometimes that I can let go with them, laugh more, teach them something and inspire them. Do you relate to this too? Are you spying on me? ? ?